Our dogs often do things that we struggle to understand. One of those things is eating grass. While we may feed our dogs a perfectly well balanced diet and provide them with all the stimulation they need, they may still take to consuming grass. There are many theories behind just why our canine friends impersonate cows chewing cud, and we are going to take a shot at the reasoning behind them. The general consensus seems to be that grass eating is not something to worry about; however, there are a few provisos to that consensus. There are a few incidences where grass eating should not be allowed and there are incidences where grass eating can be deterred by making a few simple fixes. Your dog eats every last morsel he can find under your dinner table after a meal, so why stop there? As natural scavengers, canines are programmed to search for nutrition anywhere they can find it. 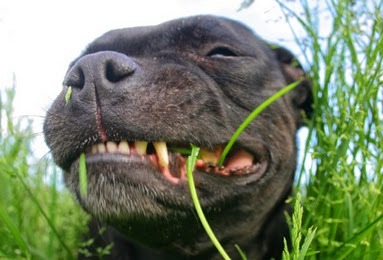 It’s possible that your dog finds the flavor or texture of grass yummy. Or it could be filling a nutritional need that his normal food isn’t, especially fiber. Prevention: Some people find that the behavior stops after they switch to a high-fiber dog food. If you think this might be the case for your pup, consult with your veterinarian before making any changes to your dog’s diet. In some cases, eating grass is just something to do to pass the time. He’s got the backyard to himself, but not much to do there. Are you providing regular exercise and mental challenges for your pup? Do you notice your dog eating more grass during times when you aren’t walking or playing with them as often? Prevention: Sometimes the solution can be as simple as providing a chew toy as an alternative or dedicating yourself to providing a consistent exercise routine. Some experts believe that grass is a form of self-medication. When your dog has tummy troubles, he turns to grass for relief. This is more likely if the behavior starts suddenly or if your dog is very anxious about needing to eat the grass, often extending his neck and making swallowing motions, and then vomiting afterwards. But most studies have found that this is actually quite rare — less than 25% of dogs vomit after eating grass and only 10% showed signs of illness beforehand. Prevention: In some cases, the stomach distress can be a sign of something more serious, like gastric reflux or inflammatory bowel disease, so it’s worth calling your veterinarian for advice. How to Get a Dog to Stop Eating Grass? 1. Give your dog chew toys and puzzle toys with peanut butter in them for play. 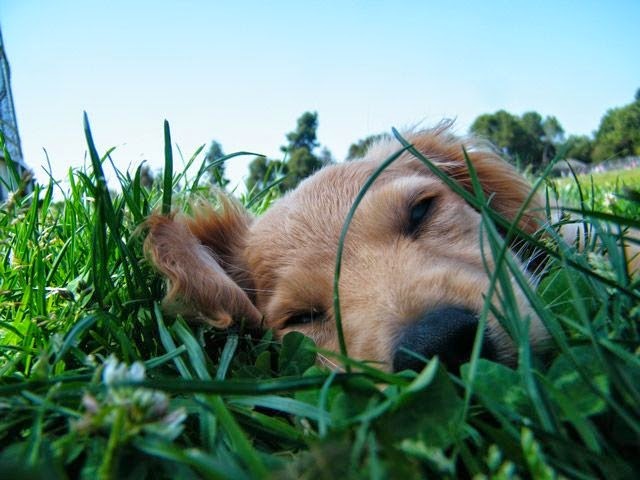 Sometimes dogs eat grass outdoors because they need more playtime and can become bored by themselves during the day. Puzzle toys require lots of time and licking to get the wonderful peanut butter treat out of the center and will keep your four-legged friend busy. 2. Play tug-of-war with your fur buddy with a rope toy. Games that are interactive between you and your pet stimulate the senses and tire him out, so he may avoid eating his greenery outdoors. 3. Teach your dog the “leave it” command. Sit on the floor indoors with an ordinary piece of kibble in one hand. Show it to him and as he reaches for it, close your hand, and say, “leave it.” Quickly hand him a beefy dog treat with the other hand. Practice this command so that he realizes “leave it” and ignoring the item will secure him a high-quality reward. 4. Clip a leash onto your dog’s collar and go for a walk. When he shows interest in grazing on grass or leaves, say “leave it” and call him to you. Give him lots of praise, petting and a dog treat. Keep practicing this command and reward system until you can let him off leash in an area of containment, such as a backyard with a fence. 5. Go to a secure environment and practice the command if your furry friend starts to show interest in grass or leaves. Call him to you and reward him with treats. 6. Phase out the treats slowly, so that your dog will come when you call him and leave the greenery alone. Offer lots of petting and praise for coming when you call him. Positive reinforcement of acceptable behavior creates a strong bond between you and your pet. If you’re worried that your dog eating grass is going to hurt them, stop worrying no need for concern here. The one possible downside is that he’ll irritate his throat or stomach lining, but this issue will only cause him irritation for a second or two at most: he’ll either cough the problem away, or will toss his cookies without further ado (which rarely bothers most dogs). Really, a dog-eating-grass is nothing to worry about – it’s a life-long habit with many dogs, and if yours does decide that it’s no longer in his best interests, he’ll simply stop eating it all by himself. You may need to keep an eye on him around recently treated lawns, or anywhere where pesticides, snail bait, and rat poison could be around, since most garden chemicals are highly toxic to dogs. Grass treatments, such as fertilizer, herbicides and pesticides are harmful to your pet if he eats them soon after the treatment. These items act as poison in your pet’s digestive system. Teaching your pet to stop eating grass and leaves altogether can keep him safe when you are in another environment and don’t know if the grass has been treated. 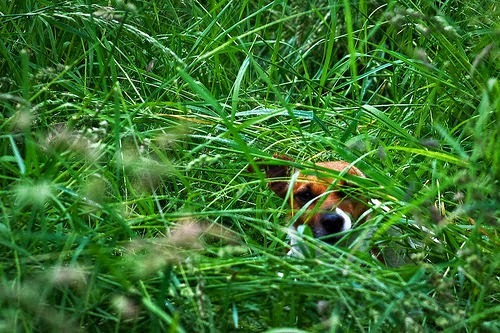 Many veterinarians consider grass eating a normal dog behavior. While dogs don’t gain anything of real nutritional value from grass, it also may not hurt them — as long as there are no dangerous fertilizers, pesticides, or herbicides used on the grass itself. You can help protect your grass eater by using only non-toxic products on your own lawn. When you’re out in public areas, keep an eye out for signs warning that chemicals have been used on the grass. You can also provide a safe alternative by growing a grass or herb garden specifically for him to snack on.